Tonight was the weekly cold water swim with the Wasatch Front Polar Bear Club. By the time I pulled into the parking lot, it was already getting dark. The rest of the crew showed up soon after. Tonight we had Gords, Jake, Matt and myself. Matt's wife Jen was also there to cheer us on. 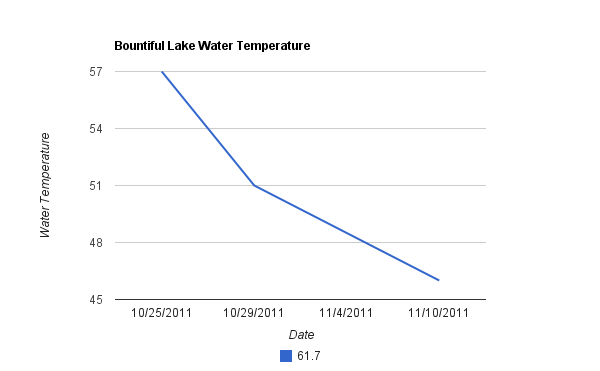 This chart shows the weekly water temperature at Bountiful Lake. We were hoping to "ease" into the colder temperatures, but that's obviously not going to happen. Gords' thermometer read 43.5 degrees! To be honest, it kind of freaked me out. My thermometer showed 46 degrees, but that didn't make me feel much better. By the time we got to the dock, it was pretty dark. I was also a "single dad" tonight and had to keep an eye on my boys. Because of all of that, I decided to just jump in instead of swim the usual 200 yards to the boat ramp. It was Matt's first time and he decided to do the same. Jake decided to jump in too. Only Gords had the guts to swim. I jumped in and the water took my breath away. It actually didn't feel as cold as I thought it was, which leads me to believe that the temperature was really around 46 degrees. After jumping in, I regretted my decision to not swim the 200 yards. I stayed in the water while Matt jumped in. Being his first time, I think he was surprised at just how cold it was. I got out after Matt and then watched Jake jump in. Gordon is a machine! It was really dark by the time he dove in, but he swam the whole 200 yards back to the ramp. After everyone left, I wanted to double check the water temperature so I put my thermometer back in and it came up 46. Next week we are going to have to get started earlier, like 4:30, so that we can actually see. It's been over a month since we were at the Great Salt Lake and I'd like to go back next week and see how things have changed. This weekend in the South Davis Masters Meet. Gords is running the show this year and has asked me to man an open water booth and demonstrate how to use the Safe Swimmer. If you are going to the meet, stop by and say "hi" and you might even win a prize.